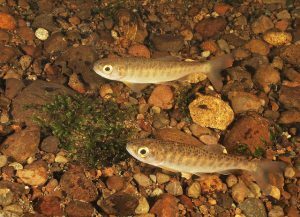 Toxic roadway pollutants captured and conveyed by stormwater pose a serious threat to coho salmon and other fish in the Pacific Northwest’s urban watersheds. New research from Washington State University (WSU; Vancouver) shows that green infrastructure can help reduce mortality rates, but that pollutants can still potentially make fish more susceptible to predators. Stormwater carries toxic pollutants from heavily frequented coastal roadways into urban watersheds. In the Pacific Northwest, stormwater runoff was identified by new research from Washington State University (Vancouver) as a growing threat to endemic fish like the coho salmon, which lies at the heart of a multi-billion-dollar aquaculture industry. Roger Tabor/U.S. Fish and Wildlife Service. WSU researchers exposed developing coho embryos to stormwater runoff samples from various storm events. The fish spent 24 to 48 hours at a time swimming in mixtures of water, motor fuel, tire rubber, litter, and any number of harmful chemicals swept by rain from the traffic-heavy Washington State Route 520. After about a month of trials, surviving coho exposed to a mix of 50% stormwater and 50% well water; those exposed to 100% stormwater; and those exposed to 100% stormwater that was first filtered through a bioretention column all demonstrated weakened sensory abilities compared to a control group. “We’re showing that even if the fish are surviving the stormwater exposure, they still might not be able to detect the world around them as well, which can make it harder for them to find food or more likely for them to get eaten,” said Allison Coffin, a WSU neuroscience professor and co-author of the study, which appeared in the journal Scientific Reports. Like many fish, coho salmon perceive sound and motion through a system of hair cells along each side of the body called the lateral line. Using a specialized dye that glows when these hair cells are activated, the researchers were able to gauge how stormwater exposure during embryo development affected the number and function of lateral line cells later in the fish’s life. At all three stormwater concentrations, coho developed significantly fewer and weaker sensory cells, particularly those exposed to 100% unfiltered stormwater. The WSU study follows up on previous research from the National Oceanic and Atmospheric Administration (NOAA), which found salmon exposed to untreated stormwater for periods of a year or more exhibited a 60% to 100% mortality rate. When stormwater was first filtered through soil-based green infrastructure like rain gardens or bioretention columns, that rate dropped substantially. Findings from the WSU study demonstrate that while exposure to green-infrastructure-filtered stormwater runoff may not directly result in salmon death, even short-term exposure can lead to life-long physical impairments that make death more likely in the future. The conclusion could help explain why salmon are dying off in record numbers in recent years. More research is necessary to determine which specific roadway contaminants in runoff could be affecting local fish, and whether advances in soil-based filtration could prevent long-term sensory damage, the WSU researchers write. Washington State University (Vancouver) neuroscience professor Allison Coffin explains the concept of her team’s research into the long-term effects of stormwater pollutants on developing salmon. Video courtesy of Washington State University. Is the original data available to the public?